The journey of a solo entrepreneur who created India’s first thematic investment platform. Individual investors are inundated with ideas, insights and a lot of information but it becomes really complex to actually start investing and make money in the markets. This is mostly because the industry hasn’t made it easy for you to do it. Here is one platform which is making investing in stocks simple and intuitive with its thematic investment approach. Investak allows you to access and translate real insights into investments. For example, there are many themes (ideas, strategies, policies, current events) playing around us which is common knowledge to all: like GST, State elections, Normal monsoon, Low crude prices, Blue Chip Value picks etc. but it is difficult to invest. Investak allows you to invest in these themes which are essentially baskets of up-to 30 stocks so you don’t have to keep a track of all the noise- if you believe in a concept, you can invest in it. The stocks in each theme is chosen by Investak and is based on a lot of parameters: fundamental research, technicals to name a few (all of which is published). They will also tell you when to sell the stocks and when to re-balance. There is also a social trading aspect as well on the platform i.e. if the user has an idea –he can share that as well. In this way, users get access to more number of themes – his own themes, themes created by other users and Investak’s themes. Investak offers a number of clusters of stocks, which are portfolios of up to 30 stocks based on market trends or themes intelligently built for you. Choose from a number clusters like UP Elections, New RBI Governor, Monsoon, GST and much more. Do you have an interesting cluster of stocks in mind? Investak allows you to create your own cluster. You can also share your cluster with other users of the platform, and allow them to post reviews as well as trade on your clusters. On one click, invest in a theme (cluster), a portfolio of up to thirty stocks. Track and monitor your investments through your portfolio panel and see how your investments are growing. Receive automated portfolio rebalancing alerts for each theme (cluster) you have invested in. Every time a theme (cluster) is re-balanced, we send notifications to the user to allow him/her to re-balance the portfolio. Every theme has minimum investment value, it starts from INR 800 and ranges up to INR 90,000. 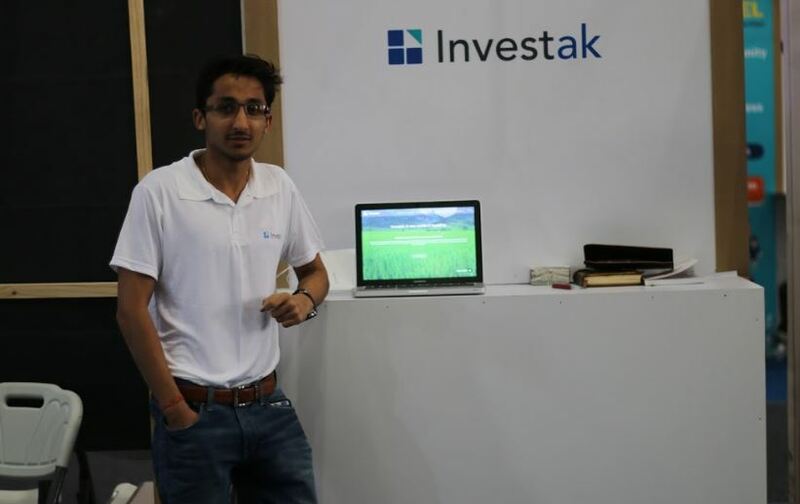 Investak was founded by Ankit Kanoria. The idea of Investak struck him when he wanted to start investing, and he was overwhelmed by the number of platforms that were available and the amount of information it had. Even though he was from a finance background, he didn’t know where to start from. He researched a lot and decided to create an intuitive platform for the first-time investors to invest. He began the journey 10 months back in Singapore, where he started building an algorithm which tells you how much risk appetite you have based on your age, income, savings, investment horizon etc. and based on the risk appetite it will tell you how much to invest, where to invest, when to sell, rebalance etc. essentially a robo-advisory solution (robo-because it was completely automated). He started off with a 5-member team and it grew well, but unfortunately the team fell through. Also, the strict regulations in Singapore did not allow him to take the platform forward. So, he left Singapore and came back to India and started all over again to build a more intuitive platform. The Cofounder crew had a rapid-fire discussion with Ankit, and here is the summary of the discussion. How is the journey so far with Investak? The platform is currently running well with a month on month increase in user base of around 50%. So far we have got good feedback about the platform, and the best part is I didn’t go for a big launch for the beta. Initially, I had just emailed to 5 people, then to 10, then 20 and 30. I got a lot of feedback- the website was slow, it was crashing, servers were not working etc. But by the time it reached the 50th customer, it was quite smooth. We have now around 250+ users who are actively using the site to access the themes, sharing their themes and trading virtually. Once the live trading option is made public, I may go for bigger launch. Am actively looking for funding now to increase our team size, to make the platform more dynamic and to market the same. What is to be like a Solo Entrepreneur? It’s like in that sitcom- Sherlock Holmes where the guy speaks to a skull. You become so lonely and you just need someone to listen to you. But it’s exciting, hope it goes well. What’s the biggest learning in your journey? I started off in Singapore but lost the market because of no proper market research. Always do a proper research or at least some kind of research before starting off. I started off with my closest friend and we fell apart. It is contradictory to popular belief: but my advice is to never start a business with your friend. You either lose the business or your friendship and in some cases (like mine) you lose both. You need to have backing and support to start your journey. In my case, I got my family who backed me up with the initial angel/seed money. There are 2 competitors who recently launched their platforms. The market has huge potential though with only 2% of Indians investing in the equity markets. I actually welcome more competition, it helps in creating awareness about such investment options to mass audience. What’s your tip for any budding entrepreneur? Don’t lose heart, just keep going ; borrowing a quote from a famous Bollywood movie which I believe sums it up really well- strive for excellence, success will follow. I don’t know how many times I thought about shutting it down. I lost a market, a friend, a product, a team, a potential partner, an advisor to name a few; but what keeps me going is my self-belief to see this through.